It’s alive! Really, it is, the blog. Three weeks to go until I can move into my new place and release the Helmers. I think I’ve finally found my home. Can I share a little? It’s a really old house, the basement is from the 17th century, a real fixer upper. The old milkmaid room is intact, it has old wallpaper from different eras layered all over it and a heavy old iron key. There’s an apple tree growing just outside the kitchen window and a pet hedgehog in the garden that sat on my lap and ate kitty food. Oh and it’s five minutes from work – and two minutes from my sushi bar. Pinch me, please? I’ve managed to set up a temporary photo corner and considering how many summery, fruity shades I have to share with you, it’s about time I get to it before fall kicks in. Here are the first two of quite a few Pop Culture Cosmetics polishes I’ve been using the past weeks. Electric Avenue is a radioactive green jelly jam packed with a variety of matte glitters . There are orange hexes, short orange bars, smaller white and blue hexes and medium hot pink & large green squares. It was a wee bit thick, but with two drops of thinner in a mini bottle it was normal to work with. This is three thin coats with a bit of placing of the larger glitters. Topped with a generous layer of Seche Vite since it eats TC. 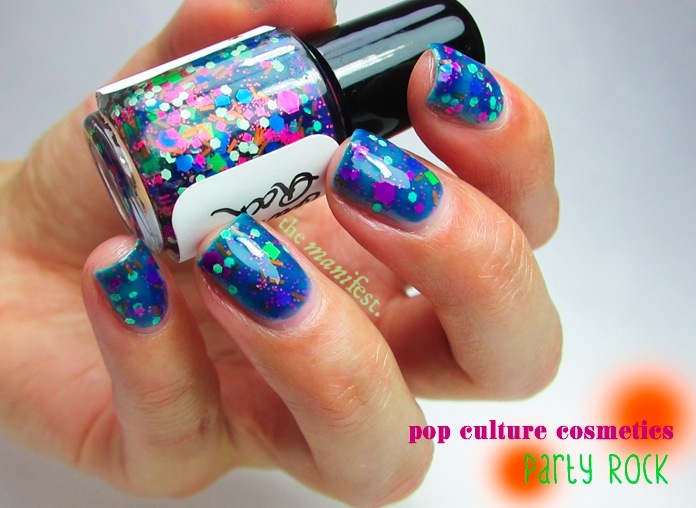 Party Rock is also a jelly, it has the same glitters as Electric Avenue plus a smaller pink micro glitter that gives it a different feel. The large hexes here aren’t orange but pink, and turn purple on the nail when covered in blue jelly. This is two ticker coats, also thinned, application just as above. I wish I had my macro lens available to really show you how fun these shades are. They feel like a pool party on my nails and have rendered quite a few… reactions! Denise of Pop Culture Cosmetics must have an imagination that never quits. She creates new coherent collections faster than you can say glitter bombs. Up on the page now is for instance a Haunted Manor collection, a Despicable Villain collection and my favourite – the Fall Festival collection. We needs it! Härliga lack men huset låter ännu bättre! ÄNTLIGEN, låter supertjusigt med huset. Nagellacket så gillar jag electric avenue, mumsfillibabblan! Det kommer nog bli lika mycket hus-swatches som nagelswatches framöver :D Älskar också EA, känns som att ha på sig något radioaktivt från the simpsons! Wow! These are full of neon goodness! Congrats on your new place! Ditt hus låter helt fantastiskt!